• The global surgical scalpels market is projected to register a CAGR of 3.8% in terms of value during the forecast period (2017–2027) and be valued at US$ 1,473.0 Mn by 2027. 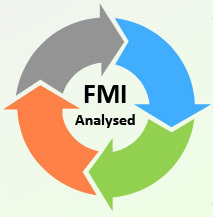 • On the basis of product type, disposable surgical scalpel segment accounted for 57.1% market share in 2016, which is expected to increase to 58.3% by 2027 end. This segment is expected to account for high revenue contribution to the global surgical scalpels market as compared to reusable surgical scalpel market during the forecast period. • By material type, stainless steel segment accounted for 42.6% value share and was valued at US$ 419.2 Mn in 2016. • By end user type, hospitals segment accounted for 45.7% value share and was valued at US$ 449.4 Mn in 2016. 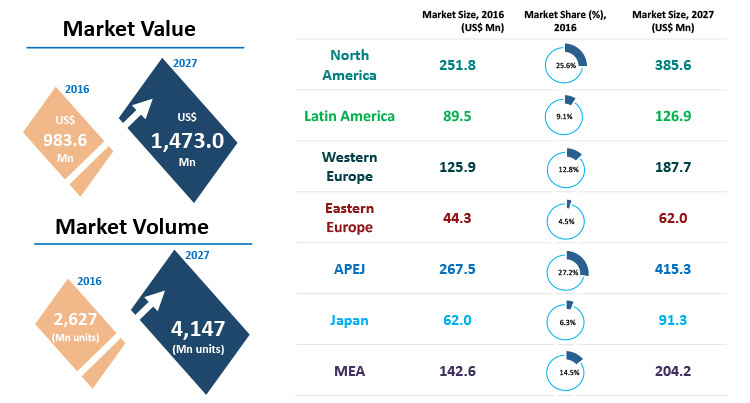 • The APEJ surgical scalpels market revenue is expected to expand at a significant CAGR of 4.1% in terms of value over the forecast period. • APEJ represents the most lucrative market, followed by North America and Western Europe. 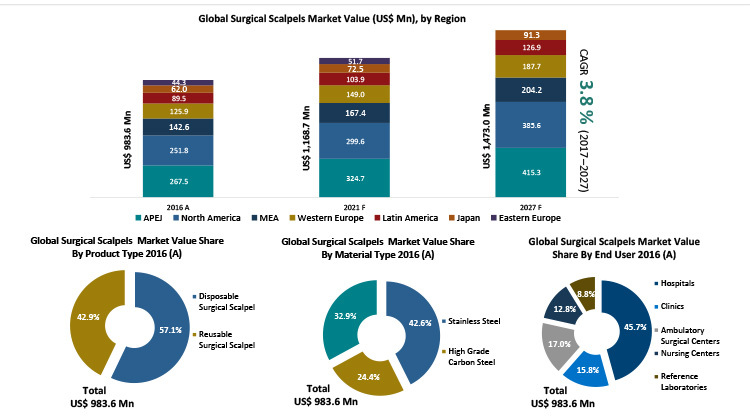 • The fastest growing healthcare facilities in the Asia Pacific region, increasing government fundings, rise in the number of surgical operations and medical tourism promotes the surgical scalpels market in the region.